I wanna thank everyone for offering me their opinions on the issue of re-drawing old strips last time. I have a few angles I am considering for Selkie merch, books being one of them, after I finish some current projects. More details as they come. Also have a Skyrim related question, for any fellow Skyrim players. After 60 hours of gameplay and some protracted non-Skyrim gametime, I just got to completing the main quest line this past weekend. Still got a lot of sidequests and unexplored areas I can go through, but I’m also tempted to make a second character just so I can build a Dragonborn that isn’t a mishmash of skill sets. So, continue adventuring, or make a new character and see what happens when I choose new story options? Even when furious Selkie is adorable! “Porksicle” sounds like an intensely satisfying word to say when you’re angry. Gotta remember that. I like Overreacting Barb. Let’s see more of that. bet they’re going out for sushi. No miss, you are going to mind your manners. I personally say make a new character because it gives you better insight to the game. Disappointed in Selkie’s behavior. I thought she was more mature than that. She’s a kid at the home of a bully who humiliated her. So I can see her being a little grumpy. *grin* Besides, Todd doesn’t get it totally easy, she’s still a kid and has to sometimes be told no! And said bully’s parents are punishing her and should not be subjected to Selkie’s ire just because Heather was a brat. Selkie has every right to be angry at Heather, but not at Heather’s parents. They’re just trying to accommodate her; it’s not like they were horribly inconsiderate that they would assume Selkie would also be vegetarian. Usually kids follow the parent. And you usually don’t come by someone named Selkie, so it’s also a very common mistake to think someone just mispronounced her name. They were trying to be nice. Don’t forget, Barb called her “creepy”. Kids don’t forget things like that. But she’s a child, you can’t expect her to act as an adult would. Yeah, but after going to a dinner she really didn’t want to attend with someone she doesn’t like, this could be the straw that breaks the camel’s back. Trust me, you get REALLY tired of having your name mispronounced and having to correct everyone you see after a while. That, and having to watch closely to make sure people don’t misspell it even when it’s written right in front of them and/or you’re spelling it out for them. Yeah she is ultimately a child. Kids her age in rl throw tantrums in supermarkets over being tired or wanting that toy the parents wouldn’t buy. She is very mature for her age but seriously I’ve seen adults older as 30 act far worse. I work in retail, so I’ve seen people in their 60s-70s act less mature than this. I can think of a few times I’ve seen grandmas throwing tantrums over not being able to return items they’ve had for months to us for cash instead of store credit. That’s all fine, I work in retail too and I can understand people of all ages can throw fits, but that’s still not an excuse. Although I’m very glad Todd is being a good parent and teaching her she can’t act like that. I’m the oldest of six kids. They’re all great, smart, polite kids. But believe you’an’me, when a little’un really gets in P.O.’d-mode, get ready for fireworks. Good kids get testy, screw up, and generally act immature…. because they ARE immature. Not mature- a child- not an adult yet. When a kid acts out, it’s not because she’s bad or bratty, it’s because she doesn’t know how to deal with her anger yet. That’s what parents are for. I still don't get how this whole reply-placement thing works, lol. You did it right. The amount of indentation tells which comment you are replying too. Compare the indentation of your comment to Preseac’s, who also responded to Kitenkaiba, and to Lily’s, who responded to Preseac. Since this is my first comment, let me just say Selkie is one of my favorite web comics of all time. “No meats? Can I cuss NOWS?” may be one of my favorite lines from the comic to date. LOL Barb reminds me of my sister! Could Selkie eat a Grilled Cheese? That seems like the easiest answer. I don’t think she could; bread’s a plant product. Chill out, Barb. This is why God gave us takeout or delivery restaurants. I like Todd’s insisting that Selkie behave as she wants to be treated, i.e. She could eat the cheese part but not the bread. Actually, after I reviewed your FAQ (I was actually looking for the strip where Todd gets her a sandwich, but I ended up reading that instead. To be honest, I think your archive is a little messy, but I digress), the Fairweather’s seem like “normal” white Americans; they must have jello. Why not just give her Jello? I say make a new character. I have had such a fun time with my new nord + crossbow. Plus then you can try siding with the other side (imperials/stormcloaks). Not to mention you can’t be both Dawnguard AND Vampire Lord. I love Selkie´s reaction in the last panel. Ahahah, Barb’s world just came to a screeching halt and you can see it on her face. I’m almost too sorry to laugh at her, emphasis on almost. As per skyrim, I suggest you keep your old character but, yes, start anew. I would suggest that whatever general direction you went in last time, go the other way. Do NOT pick the same race, that’s no fun. Be a cat, don’t ever use a torch again. There IS some satisfaction in killing a dragon on the wing with a perfectly aimed sneak-attack arrow, but being a heavy armored resto master lugging around a massive two hander that you forged and enchanted yourself is seriously like being a midevil TANK. And it is NOT as hard to stay alive as you would think. There IS something to be said of sending in a flame and frost atronoch before you to introduce a little chaos while spraying constant frost wall with one hand to slow them all down while charging AOE fireballs to kill eight people at once. And when you run out of mana, waiting not even six seconds before all 600 is back. Or killing them from the shadows one by one from afar and up close. Man I love that sneak perk. Me, I would suggest Orc warrior with conjuration buddies to help you and restoration to heal you. Never buy armor. Buy iron. Fast travel in a circle to the cities buying all the armor from the blacksmiths until you cannot carry any more. Then buy all the leather at the last store, turn it into strips, and get to making iron daggers. When you’re leveling up blacksmithing you do three hundred iron daggers and you’re almost completely there, all it takes is money and all you have to do for that is explore places. Easiest path to victory, be an unstoppable beheamoth. With friends. But yeah, go for a new character. You can do the side-quests when you’re more familiar with where you’re going with the main quests. You won’t spend your first hour completely overwhelmed by everything this time, so you will do better. Means you can do more. Wait, moderation? – Oh, probably over-posting. Oh well. There’s always In-N-Out, order a Flying Dutchman and a fork for Selkie. The perks system makes different character builds play in such a different way that it is totally worth making a new one. Come up with a concept you like the sound of and have fun. I have quite a few different characters, all of which need different tactics. My mage is a pure Necromancer (using the extra spells from Dawnguard to help out) who starts comvat with a fury/frenzy spell into a group of enemies. My thief sneaks all the way and only has an unimproved dagger as a weapon. My hunter is stealth and archery focussed, but also has the cursed ring of Hircine for unplanned werewolf transformations. Each plays so differently to each other and the game offers enough quests that you can tailor the experience to the character builds easily enough without much overlap. Don’t delete your old game though. There is plenty of content for late game, especially in Dawnguard. New strengths of creatures have new abilities and some have different looks. Some won’t show up with any regularity until you hit top level either. Oh, and new characters get the benefit of bugfixes that don’t apply to characters made before the patches were applied. Sorry to say that, but Todd, you moron! If I had a relative with special dietary needs and we were invited somewhere for dinner, I’d drop this fact ASAP. Especially if it was a make-up dinner FOR her. As for Skyrim: get out of my head. I just started a new Khajiit brawler last week. Quite a change after my Breton battlemage. My recommendation: your endgame character will probably plow through everything by now. If you enjoy that, go ahead. It might be more of a challenge and a whole new gameplay feeling to start a radically different character. I totally have to blame Todd 100% for this mix-up. It was up to him to tell the family about Selkie’s diet – he is her dad, it is his responsibility. I mean, if your kid is deathly allergic to peanuts, you do not go to a restaurant and order something unless you KNOW that there are not nuts in it, and that it was not prepared on a surface that also had peanuts on it! And, the other dads reaction “Oh, Heather only JUST told us about this…” as if it was her responsibility just makes me mad too. You’re all adults – pony up, order take-out, and have a nice evening. Anyway. I just had to add in my 2 cents. 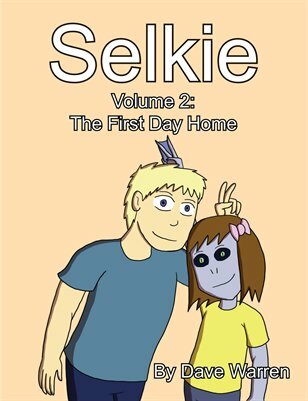 I <3<3<3 love Selkie (and the comic!)! Thing is, when Ken invited them over, he specifically mentioned ‘steak’. I can see Todd assuming that there wasn’t going to be a problem, especially since he’s rather new at this whole ‘parenting a kid with severe food limitations’ things. This is a good point, especially since Todd didn’t tell the Fairweathers he’s a vegetarian; they seem to have gotten that information through other means. He probably assumed it would be a standard meat/potatoes/vegetables type meal. However, it’s still a failure on his part. Making assumptions that things will be ok when food allergies are involved is dangerous. I´m with Chug. Steak is meat; to me, for a first-time offense that´s a good enough excuse for Todd. Still loving this, even though I haven’t posted for a while. You’ve created such real children. I would go for creating a new character entirely. Once you get up above level 30 or so a lot of the challenge has gone out of it because most of the creatures don’t level up. The first playthrough is more about learning the game, IMO. You’ll also have a better idea of what skills work best for your gameplay style. I have a lot of success with spellsword types. Skyrim (the place) is my favorite ‘world’ after the Renaissance Italy of Assassin’s Creed II. Have you done Aventus Aretino’s quest at the Honorhall Orphanage? I can’t go there without thinking of Selkie or wanting to take all those kids off to Proudspire with all its wasted space. Video Games: I haven’t yet played Skyrim, but this is how i ALWAYS play video games, from generation one Pokemon and Zelda: OoT to any game I’ll ever play. I make a first character, play until I understand the basics, then start over. Then I play my new (second) character either until the end of the game or until I realize the basics weren’t enough to do a good job. Once I’m satisfied with MY game-play level, THEN i finish the game. Usually one to two restarts. 🙂 NEW CHARACTER! Yes you may cuss but do it in your native language. I gotta say I’m liking Kenny at this point, he did the right thing. When faced with a surprising turn of events he share the new information with Todd as an equal. That show respect towards his employee. And with his line “hold that thought” he’s showing respect towards Selkie: He must know Todd talked to her about her outbrust and from Todd’s words in panel 5 he can assume Todd has talked her into apologizing [to the parents of a girl who bullied her] but in opening with “hold that thought” Kenny saved Selkie from doing that and is acknowledging that she now has a better reason to be upset because of this new mistake. He actually just gave her permission to cuss before she asked if she could. And that he did all this quickly and concisely shows it was the first option that entered his head and not a calculated move to save face. Respect and honest respect, I wish all my bosses had been like that. On the matter of Todd not telling them about her allergies. Sure it’s his responsibility but this is the first time he’s ever taken her to dinner at someone’s house. As someone who has a kid with allergies even after all these years I still forget to let people know sometimes. I sure didn’t think of it the first time until it came up at the last minute. It’s all read very realistically to me. 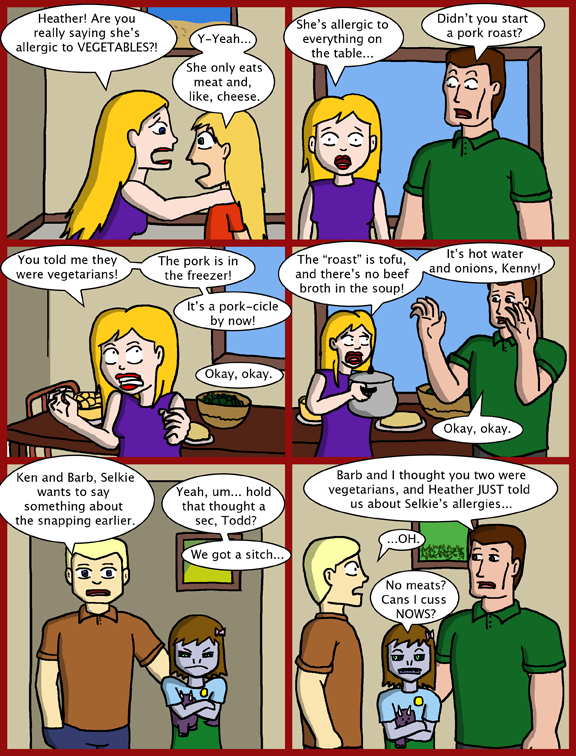 That way, he points out her dietary issues (and his own) and simultaneously lets them know that it’s fine if they don’t want to go through that much trouble to cook 2 different meals. At this point, they should just abandon Barb’s meal altogether (a shame, since she’s being an excellent host) and go get sushi or something. That way everyone is happy. Although I have to say, it looks like Todd realized that in the last panel. The “oh [silent ****]” wasn’t because Selkie wouldn’t have food, as that is easily fixed, but because he realized that he should have clarified. I love your characterizations, btw. They all seem so realistic and likeable. Mishmashes are fun! I play a Khajiit who turns in to a werewolf, and she just married Alea the Huntress so she is a lesbian now. Well by mishmash, I mean I started off perking up one-handed and Destruction, then switched to primarily Destruction, placed some points in Light Armor for defense and Enchanting for enchantments, and when I had trouble using my one-handers against dragons started perking up Archery a bit, then late in the game started perking in to Smithing to try to get better armor. So right now I am a Breton mage with a spread of perks across archery lockpicking and one-handed weapons that aren’t doing much for me, and I wish I had focused on leveling Smithing a bit earlier than I did. Yes, Selkie, you can totally cuss now. And wow, your old Skyrim character is a mess. I really recommend focusing on a smaller set of skills. Since you didn’t do sneak, I suggest that for a second character. Either sneak backstabber (points in one-handed and light armor), sniper (archery and light armor), or stealth mage (illusion and necromantic conjuration are wonderful here). All of those are neat combos for you to use. I actually don’t think she’d mind a pork-cicle. I will say that it’s nice to see a character just flat up explain a bad situation. I was really worried this was going into bad sitcom levels of “You distract them while I figure out what to do!” And then they say aurora borealis is in their kitchen. We can’t have dinner yet, it’s… on fire! Yeah, so much fire! Wooosh! Flames eeeeeverywhere. Selkie rocks hehe, and Skyrim: don’t ask me, I start new characters all the time perfecting the skill set balance. I have 160 hours of time played in Skyrim and I haven’t even finished the main quest because i keep restarting. But at least now I get my archery skill to 50 by level 11/12….. yeah. Yes dear, now is the time to cuss. A real bollix of a FUBAR. I rather like that the mother is so caring about this. I personally would never invite both a Vegetarian AND an Obligate Carnivore to dinner. Their diets are completely mutually exclusive. Hospitality nightmare.